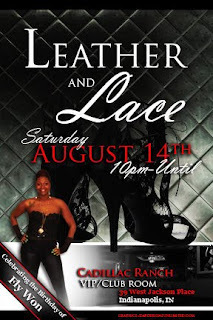 This Saturday, August 14th at Cadiilac Ranch, Fly Won will be hosting her Leather and Lace BDay Bash also known as Fly Day to most :)!!! Get your leather and lace together ladies or just come out in your fly club gear, like the fellas are going to do!! WE WILL BE PARTYING ALL NIGHT!!!! All of your friends will be there! I have $8 wristbands for sell for everyone who wants to be guaranteed entry. If I were you, I wouldn't wait to pay at the door. This wristband comes with PERKS and those perks are a FREE (yes, 1 FREE) shot of Grey Goose and an *exclusive offer* that only having the wristband from me will get you, your picture up on the Notable Styles and More Blog, yes, this blog that you are reading right now. So comment on this post, when you are ready to let me wristband ya!! ;-) Or email me at imnotonik@gmail.com.